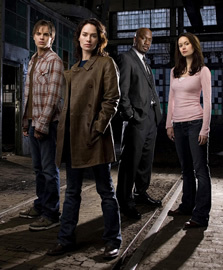 Performers include: Lena Headey, Thomas Dekker, Summer Glau, Richard T. Jones, Brian Austin Green, Garret Dillahunt, Shirley Manson, Leven Rambin, Dean Winters, Stephanie Jacobsen, Mackenzie Brooke Smith, and Sonya Walger. This series picks up roughly where the second feature film, Terminator 2: Judgment Day, left off. After successfully destroying all traces of Terminator technology that could be used to create Skynet, Sarah Connor (Lena Headey) and her 15-year-old son John (Thomas Dekker) are wanted the police because its believed they are responsible for the death of computer genius Miles Dyson. Sarah and John have tried to start a new life in a small town in New Mexico. Their lives are turned upside down once again when a Terminator from the future named Cromartie (Owain Yeoman, David Kilde, Aaron James Cash, and Garret Dillahunt) appears at John’s school to assassinate him. He’s saved by a pretty girl named Cameron Phillips (Summer Glau) who is actually a reprogrammed Terminator from 2027 that’s been sent back to protect him. In an effort to escape their pursuers, the three travel through time from 1999 to 2007. Their sudden arrival in the future attracts attention and Sarah’s former fiancee (Tim Guinee, then Dean Winters) sees them on TV and calls the authorities. FBI Agent James Ellison (Richard T. Jones) initially believes that Sarah is deranged but begins to wonder about this assessment. While evading their pursuers, Sarah, John and Cameron try to find a way to stop Skynet from ever coming into existence. Derek (Brian Austin Green), the brother of John’s father, comes from the future and joins them in their fight but his true intentions may not be clear. Can’t believe they canceled this. Great show with a lot of possible plot twists. Good cast. Interesting characters. Great action. Why in the world was this dropped? I am sooooooo upset about this! How can Fox leave us hanging like this??? Couldn’t they have been kind enough to make one episode that answered all of the cliffhanging questions!!! And Dollhouse???????? PLEASE!!!!!!! Get rid of that garbage! This show is the best. It needs to continue airing. It was the best on its kind on TV (besides 24). Those two shows I watched every week and now with a great cliffhanger for season 3 there wont be one. i hope at least that another network is smart enough to pick it up.